If there was any question of the toll that chasing a four-minute mile took on Sam Borchers and Ben Hubers, there was ample evidence on the infield podium 45 minutes after the race. Completely spent, the two runners were splayed side-by-side across the wooden dais, flat on their backs, awaiting an awards ceremony of which they were barely cognizant. Hubers, who’d red-lined the early pace before the effort destroyed him in the last 100 yards, was alarmingly pale, staring dizzily into space with glassed-over eyes. Borchers, who’d bided his time in the opening laps and kicked down Hubers from behind to win in 4:03.33, eventually gathered the strength to stagger to a trash can, where he emptied himself of everything save the lactic acid consuming his legs. Then he gamely wove back across the grass and crumpled once more to the platform. Neither could muster the energy to stand again until their names were announced, and even then, a disoriented Hubers required copious assistance. 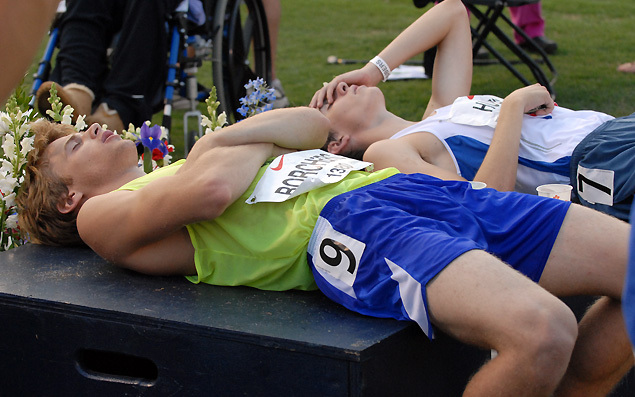 Such was the damage these two runners wrought on their bodies in the pursuit of an historic pace. It began, of course, not with Hubers and Borchers, but with Evan Jager one heat earlier. Jager, the Illinois senior consigned to the supposedly “slower heat” due to a meet rule that requires an elite athlete to choose between top-level heats if they enter more than one distance race (Jager chose the Friday night two-mile), was intent on dropping a quick time that would still land him on the podium, even if it meant emerging from the second section. Suddenly ten yards arrears (left) , Jager hung tough through the turn and reclaimed the lost real estate when Cameron’s ambitious move returned to haunt him on the homestretch. Jager charged by his struggling opponent to record the 4:05.68 win, then settled in to watch the fast heat and see where his cards fell. Had his blistering time caught the attention of the runners lining up for the final heat? Borchers admitted it had. Hubers, expected to be one of Borchers’ primary challengers for the title, exploded off the starting line like a man possessed. When he split 58.2 for the first quarter, he’d already gapped the field by nearly 30 yards. 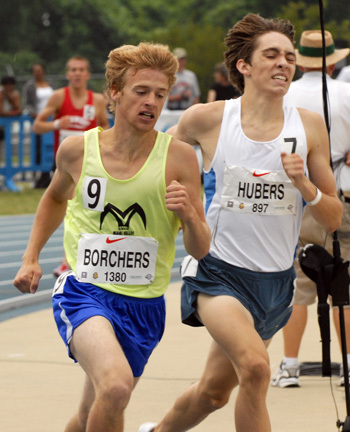 Borchers was at the head of the chase pack, starting to wonder if Hubers was coming back. 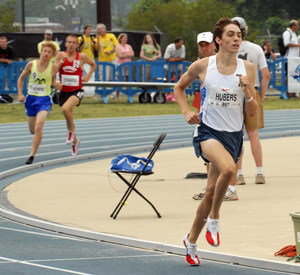 Indeed, Hubers was flying, hitting the half in 1:58.6 and showing no signs of waning. When fellow Ohioan Jake Edwards drew up to Borchers’ shoulder, it seemed to tangle the two into a battle for second and left the impression that Hubers might have actually stolen the race, and that he might seriously scare the four-minute barrier. As Hubers crossed the three-quarter in 3:00.7, the grandstand was delirious. That’s when Borchers, known for his devastating kick, finally made his move. Would Borchers' famous kick fail him? Borchers flew down the backstretch, risking several glances back at Edwards as he closed on Hubers, and for the second time in as many days, the Nike Outdoor Nationals had a pair of contenders rounding the final turn with both a race and an historic mark on the line. As they reached the top of the straight, however, (left) it was clear that both Hubers and Borchers were suffering for the ambitious pace. Arms flailing, Borchers slipped past a fading Hubers and then willed his body toward a line that wasn’t nearly close enough. With Borchers breaking the tape in 4:03.33, and Hubers a few strides back in 4:04.98, the race still went down as the #5 high school-only mile in US history. Jager’s gritty 4:05.68 from the prior section did indeed hold up for a bronze medal, while Cameron’s 4:07.32 runner-up to Jager bumped top heat third-placer Edwards to fifth overall at 4:08.02. 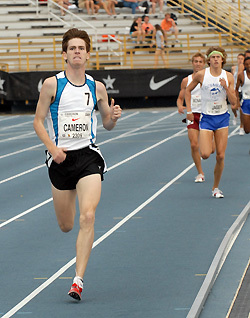 In all, an impressive twelve runners ended up at 4:10 or better for the full mile.